Introducing edible wafer paper cake illustrations from Fancy Flours. Now enjoy the ease and beauty of wafer paper images on cakes! Our Easter Bunnies design fits an 8″ round cake. Simply cut out and apply to fresh buttercream, or use light Karo corn syrup to apply to a fondant surface. Add to a store bought cake for a quick custom look. Wafer paper is made of dehydrated potato starch, water and vegetable oil. The thin edible paper is then pre-printed with food-safe dyes. Wafer paper is tasteless and does not “melt” into the frosting, it will remain as a thin sheet of edible paper on top of your sweet confection. Using craft scissors, carefully cut out your wafer paper image along the outer cut line provided on the design. You will want to trim carefully for a clean, finished look. Butter Cream Frosting Application: Apply the trimmed wafer paper illustration directly to a smooth surface of fresh buttercream frosting. Working from the center outwards, smooth any bubbles that may exist. You can consider the cake done at this point, or, pipe a decorative edge around the cake to hide the edge of the wafer paper. Fondant Application: If your cake has a fondant surface you will want to apply a thin layer of Light Karo Corn Syrup to the back side of the wafer paper illustration using a craft brush or a very soft basting brush. (Light coating only). Turn the wafer paper illustration over and apply to the top of the cake. Starting from the center, smooth the wafer paper outward towards the edges to get a good seal and to remove all bubbles. The cake can be considered complete at this point, or, add a decorative piped border. Store-Bought Cake Application: Request that the grocery store or bakery refrain from sprinkles or colored decorations on the top surface of the cake. If the surface is not fondant, just cut out and apply the wafer paper directly to the surface of the cake – smoothing it out as best as possible so that it does not get waves or wrinkles. The paper is really very forgiving. Tips for Success: Wait until the day of your event to apply the wafer paper illustration and only allow the cake to be refrigerated for a few hours before serving the cake. Note: we have left a store bought cake with a wafer paper topper in the refrigerator for 3 days without any color transfer or wrinkling – however, humidity and frosting moisture are factors and may vary greatly from our test conditions. Perfect dessert for your Easter celebration! Independence Day is coming right up! 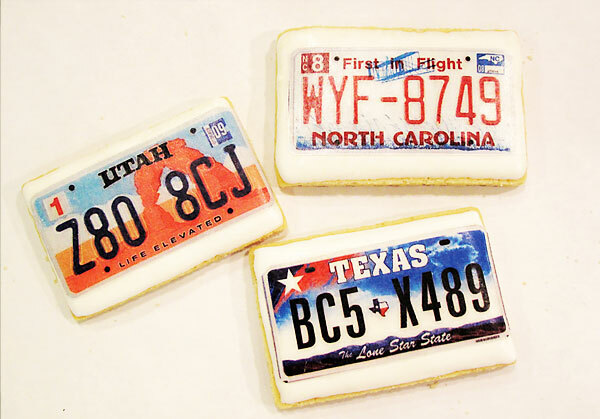 Here is a how-to for making Vintage Independence Day Cookies with edible wafer paper images! 1. Use No Fail Sugar Cookie recipe and cut out several rectangle cookie shapes. Bake and cool as directed. 2. Ice each cookie with 1 layer of royal icing. Let completely dry. 3. Carefully cut out wafer paper shapes using craft scissors, making sure each one will fit on the cookie. Be careful, wafer paper is fragile! 4. Adhere each wafer paper cut out to a cookie shape by adhering a thin layer of edible clear writing gel (or light corn syrup) to the top of the iced cookies. 5. Flip each cookie face down on a piece of wax paper to dry for about 30 minutes (this will keep the wafer paper shape flat). 6. Flip cookies over and add additional decoration, such as edible glitter or dragees with the edible clear writing gel. 7. Let completely dry and store in an airtight container. Mother’s Day Gift & Treat Ideas! Celebrate Mother’s Day with great gifts, fancy treats, and scrumptious recipes from Fancy Flours! We have everything you need to make Mom feel special on “her” day! Here is a mix & match of fun Mother’s Day gifts & treat ideas to get you started! Mother’s Day is just around the corner, May 13th!